They left Hiraizumi before the festival ended. Kurenai spun a little bit of her magic with the innkeeper, allying any suspicion. (“We’ll be gone before dawn, to make good time on the road. Don’t trouble yourself with breakfast on our account.”) The kindly innkeeper had filled her hands with wrapped onigiri for the journey. Ka-chan led them to the cut-short trail, but it was Kakashi, pinch-eyed and frustrated in the moonlight, who showed them the lack of footprints, or disturbed foliage, or any other trail sign. Except for the scent Raidou couldn’t detect, and the collective cold prickle on their skin, there was nothing to say anything had been here. The forest was alive with night-song: the chirping insects and whooping snow-monkeys were downright raucous. Hayama, infested with scorpion-dog demons, had been deadly silent. Genma crouched and swept his chakra out like a scythe. Kurenai, more delicately, did the same. Ryouma bent his dark head over the exact point the scent-trail ended, having Kakashi repeat a blow-by-blow account of what he’d sensed and when he’d sensed it. Emphatically not a chakra-sensor, Raidou hung back and kept an eye on the surroundings, guarding his people while they sank through the world’s skin. No one turned up anything new. The next step was to run an organized grid-search around the village. Twice, Genma, Kurenai, and Kakashi swore they felt something, and Ryouma rousted what turned out to be a very surprised — and very annoyed — badger, but there were no more scent-trails. More disturbingly, when they returned to the original spot, Kakashi reported the scent was gone. “What about your dogs?” Ryouma asked. They were all tired and slightly frayed by this point, and Raidou was starting to reconsider the sense of pressing on, but bedding down in a village under scrutiny held even less appeal. Though, beyond the strangeness of it, there was no proof that the vanishing watchers were related to Tanigawa’s sake theft — or even a threat at all. In the end, Raidou split off a dense shadow-clone — overbuilt enough to last a few days — and stationed it above the village, with instructions to destroy itself if anything notable happened. Thus freed, Team Six and Kurenai were able to press north, towards Tanigawa and their original objective. They travelled through the night, twitchily alert. By dawn, they’d covered more than a third of the distance, and the ground was starting to rise steeply. A lavender horizon revealed distant snow-capped volcanoes that marked the border between Hotsprings Country and Frost Country. Kurenai, still struggling to keep up with an ANBU pace (though a week with them had improved her), was starting to lag, and Kakashi wasn’t much better. Genma was shadow-eyed, and Ryouma’s temper, always a reliable marker of how he felt, was turning snappish. There’d been no more unseen eyes for the last dozen miles. Raidou called a halt before the sun had quite crested the horizon. A thick grove of evergreens bordering a clear, cold stream made a welcome campsite. Ryouma drew the short-straw — mostly because his sour mood was beginning to erode even Raidou’s patience — and found himself stationed in a tree to keep watch. Kurenai spread her bedroll and collapsed on it, only persuaded to get back up and care for her feet at Genma’s urging. Kakashi, mechanically, did his share of camp chores, vanished two of the onigiri, and fell into his own bedroll. Genma made a small, well-banked campfire to heat tea-water over, drank one weary cup, and followed suit. Blessed with stamina over chakra-sense, Raidou was less exhausted. He stretched well-used muscles, found a comfortable tree to lean against, and sat down to annotate his map and make coded mission-notes in a battered journal, marking times and locations of the strange not-sightings. The stuffed tanuki, Raidou noted, had survived the trip, migrating from Ryouma’s banished yukata to the shoulder-strap of his armor. He was using it for something like a pillow. The puzzle box had vanished into Kakashi’s gear. “We’ll owe you the second half of a festival,” Raidou promised, and climbed back down to find his own sleep. Three hours later, he traded watches with Ryouma. Three hours after that, Genma took over. He’d tied the dyed straw charms around his wrist, where they made bright lines of color against black underpinnings. Just after midday, before Genma’s watch had ended, Kurenai and Kakashi clawed their way back to the land of the living. A campfire lunch restored everyone to better humor. Kurenai excused herself with dignity to wash up around a bend in the stream and change clothes. Raidou, Ryouma, and Genma splashed with rather less dignity. The water was ice-melt cold, but at least it woke them up. Kakashi, blearily awake, vanished for ten minutes and returned with damp hair and a clean uniform. They packed camp, warmed up, and set out into the golden afternoon sun. The road was steeper, but they made better time nonetheless. By late evening, the path split and curved down into a green valley, marked by a peeling wooden sign that proclaimed, in slightly misshapen kanji: Tanigawa Village, where Sake is Best. Ryouma squinted at it. Genma murmured the translation to him. In the valley’s heart, lantern light glimmered on a broad stream. Tanigawa was half the size of Hiraizumi, if that, but its buildings were bigger. Steep thatched roofs designed to shed snow towered over two- and three-storey windowless warehouses. Clustered around them like children were the peak-roofed homes of the sake brewers, and the few shop fronts that served the village. A broad ribbon of white marked the path of the Kinano river — source of the water that birthed Tanigawa’s famed sake; even at this distance, the rumble of the falls was easy to hear. Light glowed in windows, and a trio of red lanterns marked the doorway of a little izakaya. It didn’t look like a town under siege. A quick chakra sweep didn’t contradict that impression. There were people, pets, and livestock in the village, and the expected wildlife in the forests surrounding. No ninja. No strange chakra signatures. Nothing to set Genma on edge. He turned to Raidou and shrugged. “Unless it’s an inside job, and we alarm them with scary ANBU uniforms,” Kakashi muttered. “Jounin it is.” Genma said. He knelt and removed his pack to extract the violet linen scroll he used for clothing and personal items. A twist of fingers and a weak chakra discharge brought his blues and a vest tumbling out. 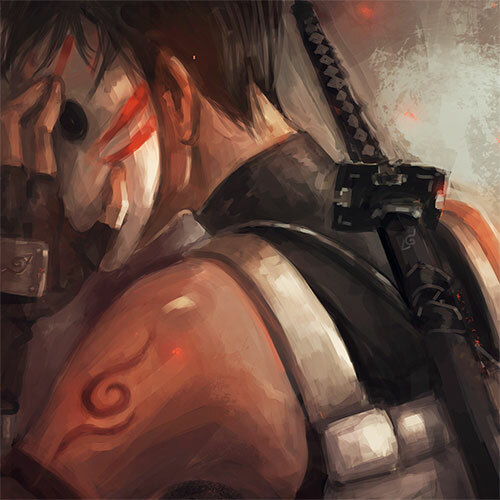 He divested himself of sword and armor, then other weapons, belt packs, and gloves, and piled them neatly on the ground, before peeling himself out of the clinging ANBU top. It was damp with a day’s hard use, but if he applied Kakashi’s water extraction jutsu it would give him another day’s wear without being too gross. After the heat of the day, the mountain-night air was a blessing on his bare skin. Next to him, Raidou and Ryouma were easing free of armor and underpinnings as well, until they were both stripped to the waist. Ryouma stretched and twisted, making the twining lines of the tattoo on his back undulate in the dim light of a crescent moon. Both he and Raidou still had strips of new, pink skin over their shoulders: legacies of abrasions from the harness ropes they’d use to tow Genma, Kimiko, and Sango through Mist’s treacherous sea. Genma banished the memory before it had a chance to grow. On a mission was never the time to dwell on the previous mission, unless the two were materially related. Raidou stretched, too, graceful in his strength, before he sighed and slipped the navy shirt on over his head. Hastily, Genma did the same. Kurenai, who was already in jounin uniform, stood with her arms crossed, alternating between watching her teammates while they changed, and scanning the path down into the village. Kakashi, of course, had vanished. He reappeared just as Genma was wringing the last of the damp out of his ANBU underpinnings with Kakashi’s jutsu. He looked as fresh as if he’d just come from a bath. Genma folded the blacks and piled them with his pale armor, for resealing in a fresh scroll. Genma wasn’t quite sure why he breathed a sigh of relief — was it for Ryouma or for Ginta? “And I appreciate your labor, believe me.” He activated his jutsu, and the scroll curled up around his ANBU kit. There was a soft pop as the mass of clothes, armor, and sword disappeared into the summoning dimension, leaving a vacuum to be filled, and then there was just the scroll, neatly sealed. Genma caught it one-handed before it hit the ground. “Yep,” Raidou said. “Tousaki, since you made a point about it, let’s have your face front and center.” Genma resisted the urge to laugh. Ryouma was pretty, even if he was highly aware of that fact. Shadow thing? Like something a Nara might use? But that was bloodline. Did Raidou mean shadow clones? Kakashi nodded once, and vanished. Raidou and Ryouma made a solid bulwark in front of them. Muscle in the vanguard, stealth at their backs. It was a little strange to be the ones being escorted. Not that Kurenai and Genma weren’t one-hundred percent lethal in their own rights, of course, but it was a marching order that made sense. The way down the narrow road into the valley was entirely safe and unremarkable. Crickets and frogs sang in the trees, a slight wind carried only the scent of cooking fires from below, and the few clouds in the sky shredded away, revealing a blanket of stars bright enough to light the path. “Oh, you’ll be wanting the mayor’s house, then,” the old woman said. She set aside a ball of yarn she’d been winding and creaked down from her porch, slipping into a waiting pair of wooden geta at the bottom step. Raidou went to meet her half-way, with the others at his back. Raidou’s reply was a mischievous wink that made Genma laugh. “ANBU captain is plenty for now,” Raidou told her. He kept a sharp eye on Ryouma and his ‘date’ as they followed her through the village. Several other villagers were out and about, enjoying a stroll before bath and bed, socializing, or attending to last-minute chores. “Suki-san,” someone sang from a house ahead. “Suki-san! Who are— Oh.” The voice trailed off as a younger woman appeared. Three, of course, because Kakashi was as invisible as a wraith. “Why else would they be here?” Suki made a dismissive gesture. “They want to see Nomiya-san,” she added. Suki made a shushing gesture. “Have people been going missing, too?” Ryouma asked. A kind of weary dread curdled in his stomach, but not surprise. They’d been waiting for something like this. The other woman snorted bitterly. She drew breath— then let it out, her gaze shuttering, as a blocky man stepped off the porch of the village’s largest house. A teenage boy, evidently a runner who’d brought word of the shinobi arrival, dogged his heels. Curiosity or worry had drawn a dozen other villagers. They stood murmuring, giving the shinobi a wide berth. The man came forward. He was in his late thirties, dark-haired and thickly muscled. That barrel chest and heavy arms promised punishing power, but not speed. Ryouma watched his hands. Genma and Kurenai could pay attention to everything else. “Thank you, Suki-san.” Nomiya’s big hands were tight, but the missing sake could be excuse enough. And even in Fire Country, civilians weren’t always glad to see ninja. “Come on, Suki-san, I’ll walk you back.” The angry woman took Suki’s other arm. She looked at Nomiya like a knife, in one brief unguarded glance, then lowered her eyes to the dirt and walked away. “Let’s hear the story first,” Raidou said. “Come in, then.” Nomiya turned — not afraid to show his back to shinobi, Ryouma noted — and led the way up two steps into his house. The villagers milled, murmuring, behind them, but only two followed: an older man, his thinning hair nearly grey, and a middle-aged woman almost as broad as Nomiya. The mayor introduced them as Goto and Inada, owners of the two other breweries in the village. Kakashi was still out ghosting somewhere in the shadows. Kurenai had faded back into Raidou’s wake, her long lashes dimming her crimson eyes. Ryouma took the spot beside her, behind the officers on the crisp tatami mats. The three brewers arranged themselves opposite. Inada nudged Nomiya, and he belatedly offered tea. Raidou accepted graciously, adding, “Yuuhi will help you.” He didn’t look around. Kurenai eased to her feet. “If you’ll show me where the things are, Nomiya-san.” Her voice was a little softer, her gaze still downcast. Ryouma stared. Did she really think anyone would believe a Konoha kunoichi subservient? That might be true. The house certainly showed enough signs of neglect for a three-week absence: mud in the genkan, a crumpled jacket dropped in the corner, dust on the surface of a low chest against the wall. Nomiya wasn’t any more used to cleaning up after himself than making tea or helping in the kitchen. Ryouma wished they’d gotten the name of Suki’s friend. They’d want to speak to her, when they were done here. “We get bandits in the mountains,” Nomiya explained. “You ninja don’t send enough people here to clean them out.” He barely glanced up as Kurenai returned with tea, though she knelt gracefully to pass cups and pour. Nomiya wet his lips and set the cup aside. “When the bandits come, is it usually the same group every time?” Genma was watching him intently. “What do you think happened?” Raidou asked Inada. “Oh, no. Let’s not do this again,” Goto said hastily, but Genma overrode him without raising his voice. Once the rest of his team had been escorted inside the mayor’s house, Kakashi’s first stop was the breweries. The three warehouses were old but well-maintained, built of gleaming dark wood. They smelled of fermentation. The doors had heavy locks — all old, but untampered. The roofs were whole. The windows undisturbed. The foundations sunk deep and solid, with no indication of tunneling. There was no evidence of recent chakra-work. Except for an obvious lack of sake, there was no sign anything had happened. Inside the long, dark warehouses, vast brewing vats stood empty, waiting for the winter. Row after row of shelves were also empty, but dusty circles showed where the maturing sake casks had been. If Kakashi didn’t know better, he might have thought Minato had Hiraishin’d in and helped himself to an early vintage. His next step was to slip through the village, looking for signs of hidden storage. He found several root-cellars, already half-stocked with provisions for winter. A few larders with private reserves — small casks, homemade wines, nothing intended for the Daimyou. One tiny attic filled from joists to rafters with dozens of finely stitched festival costumes, carefully folded in paper and left to the dust. The homes, for the most part, just contained families. A young couple trying to soothe a colicky baby. Laborers exhausted after a long day’s work. A fraught man attending to a bedridden elder. Ordinary people doing ordinary people things. If someone in the village was guilty, they were hiding the trail remarkably well. The crowd was still gathered outside the mayor’s house, watching with wary concern. No one, notably, had run to defend a hidden cache — or just flat-out run for the hills. They stirred as the mayor’s front door opened. From a rooftop, Kakashi watched the mayor lead Team Six and Kurenai to the breweries, trailed by two of the older villagers and just about everyone else. Most villagers carried belt-knives as a matter of course, but no one’s hand grasped additional weapons. They were fearful — and if news of Tsurugahama’s broken port had reached them, Kakashi didn’t blame them — but they weren’t panicking. Konoha, for all its errors, had built a solid relationship with Fire Country’s neutral neighbors. That coin was still good. Kakashi left his team to it and went to break into the mayor’s house. Stress clouded the air so thick it was like breathing iron. Heavy, masculine, with a sour undercurrent of old rice wine, bottled into airless rooms. The scent of brewing tea, for all that it was fresh, barely competed. Kakashi resisted the urge to clamp a hand over his face. The downstairs had been tidy once, now sliding sideways into disorder. There wasn’t much to search. A few papers written in a labored hand — house accounts, mostly. An unexceptional kitchen. A small, traditional bath with mold flowering along the timbers. The storage trunk in the main room yielded a jumble of small tools and half-finished mending. At the bottom, Kakashi unearthed a picture in a damaged frame. It showed a pretty young woman with a strained smile. Nomiya stood behind her, one possessive hand on her shoulder. Two young children, a boy and a girl, stood very properly at her side, shoulders straight, unsmiling. Uneasily, Kakashi put it back. Upstairs, there were just two bedrooms. A room previously shared by Nomiya and his wife, the other containing two small, child-sized futons. And Kurenai. Kakashi stiffened reflexively. She flicked a glance at him, then returned to investigating the dresser drawer she had eased open. Kakashi shook off his surprise — clone, or real Kurenai? He’d seen one of her go to the breweries — and padded up behind her, avoiding the moonlight slicing through the small window. The drawer was empty. So was the rest of the dresser. No clothes, no toys in the closet, no abandoned socks in the corner. Even the bedding had been stripped. The other bedroom contained things that clearly belonged to Nomiya, but nothing his wife might have owned. None of her clothes, or carefully kept precious items. Not a single hairpin. He didn’t really need to ask. The clone’s fingers framed a trail of brown marks on the tatami, faded by scrubbing, but distinctive. Old blood. Caused by something violent enough that it had sprayed, not just dripped. Kakashi straightened up and looked at the walls. He couldn’t risk turning on a light, but there was enough moonlight to see, when he looked close enough, places where timber had been dented by force. The clone found another old stain near the window. It didn’t touch this one. They went back downstairs. The bathroom, on second viewing, was bare of anything traditionally feminine. Nomiya’s razor and toothbrush were still here, but there were no combs, make up, or supplies for a woman’s monthly. It was possible to kill cleanly, but civilians generally didn’t. There would be more sign here. The clone gave him an ironic look, but only said, “We’ll meet you at the tanuki statue.” It blinked out of existence with a nearly-silent pop and a shimmer of falling mist. Kakashi let himself out of the bleak house, and inhaled clear air gratefully. A sweep of the village’s perimeter was unrevealing. There were trail signs — animals, travellers, villagers — but nothing unusual. Nothing with long, demon-sized claws. No scent of sulphur, or an unnatural chemical tang. Not even the strange chakra-burn from Hiraizumi. The few rutted wagon tracks heading to nearby fields and rice paddies didn’t seem overly laden. A twist of decay led him to a half-eaten hare. There were no freshly dug graves. Only one thing made him pause. On the northern tip of the valley, near the tall waterfall, a craggy hollow held a pale gleam. When he dropped down to investigate, he found a broken shrine. The housing had mostly collapsed, and the statue it contained had been worn faceless by seasons; there was just a suggestion of clothes on the round figure, a knobbly object clutched in one hand. The ropes surrounding the figure seemed new, though. The dangling paper charms hadn’t yet rotted away in the wind and weather. At the statue’s feet, a small sake cup lay tipped to one side, next to a trio of stale cakes. A bunch of ragged, wilted flowers looked grey in the shadows. Crushed moss made a faint impression; Kakashi thought someone might have been kneeling. He inhaled. Any lingering scent had faded days ago, swallowed by wind and summer heat. There were just the remnants of a prayer. He turned and made his way back to the tanuki statue. For all that Kurenai appreciated the end product of a sake brewery, she’d never had any interest in the process itself. The brewery tour would have been as dull as she expected—Here are the vats, here are the empty shelves, here isn’t the sake…—if it weren’t for the people leading it. Her brief search of Nomiya’s kitchen had only reinforced her initial impression that the ‘wife visiting relatives’ story wasn’t nearly as innocuous as Nomiya meant it to appear. The clone she’d left in the mayor’s house was still investigating. Which left Kurenai free to hang back at the tail of the group, silent and sharp-eyed, watching the way Nomiya forced himself to defer to Raidou. Wealthy and powerful by his village’s standards, big by anyone’s, Nomiya wasn’t used to having his authority supplanted, and he didn’t like it. He didn’t like his fellow brewers, either. There was a subtle tension between all of them, breaking overtly now and then as Nomiya criticized Inada or condescended to Goto. Weeks of pressure suddenly catalyzed by the shinobi arrival, Kurenai thought, but the cracks hinted at something deeper. She wondered if the mayoral position was elected, and how Nomiya had won. Ryouma fell back beside her. “D’you believe in curses?” His voice was low, but Goto’s had sharp ears; Kurenai saw the old man glancing back. Ryouma said, “Progressive attitude.” He managed to sound almost deferential. Maybe there was hope for him yet. “And prosperity has brought bandits?” Kurenai asked. Goto excused himself with a murmured apology; beyond him, Kurenai caught a glimpse of Raidou looking frustrated. She wondered whether Nomiya had summoned Goto to interrupt her conversation, or his own. The brewery tour ended soon after. It was full dark, the sky lit by a fingernail moon and a brilliant river of stars. Nomiya waited by the brewery door until the last ninja exited, then closed and locked it. “I hope you’ll do me the courtesy of staying at my home tonight,” he told Raidou. His broad face looked disturbingly dour in the yellow glow cast by the security light over the brewery door. Kurenai missed Nomiya’s response in the flicker-moment of her clone’s memory cascade. She blinked away the overlay of Kakashi’s masked face and Nomiya’s empty house, and caught Genma looking sharply at her. She shook her head. He relaxed minutely. “An’ ruin Konoha’s reputation forever…” Ryouma trailed after him obediently. “Good.” Kurenai’s own anger was cold, deeply buried, and growing. She dropped the silencing genjutsu and retraced their steps toward the edge of the village. Genma corrected her once, with a slight shoulder-touch; he’d seen the house Suki-san’s friend came from. It was small, plank-walled and thatch-roofed, but light still gleamed between the narrow wooden shutters. “And did you?” The woman came through a sliding door into the genkan, her dark eyes unafraid. She was still dressed in a dark cotton kimono and plain obi, as if she’d expected these late-evening visitors. Laughter-lines framed her mouth, but her lips were drawn thin. The woman looked at Genma. “Where are the rest of your band? Team?” She pronounced the word the way Ryouma did, when he wasn’t quite sure it was right. “Kurenai. This is Genma.” No surnames here; Noriko wanted trust more than identity. Kurenai reached a hand up, and after a moment Genma folded down on the edge of the bench next to her, where he could still watch the mouth of the alley. “Nomiya has enemies?” Kurenai pressed. Kurenai flexed her hands and carefully did not say, She should have come to us. Maybe they could still rectify that, though. If they could find Harubi safe, first. She asked instead, “Has there been anyone through the village lately that she might have asked for help? Traders, travelers, anyone who could get a message out?” Particularly if she’d promised them payment. Twelve wagon-loads of sake vanished in one night still loomed as an insurmountable obstacle, but they were close to discovering the who. After that, how would follow. “How soon after that did she disappear?” Kurenai asked. Suggesting Nomiya could have killed them all, then stolen the sake to distract villagers’ attention and give him time for a cover up? The solution was elegant in its simplicity, but even more impractical than Kurenai’s current theory of a sympathetic bandit gang hiding in the mountains. How was one man supposed to move two hundred sake barrels in one night? Not to mention accessing the barrels in Goto’s private stash. Noriko shook her head. “Suki thinks Harubi was snatched by forest spirits. There’s an old shrine Harubi liked to pray at, when she could get away, but you won’t find it in the dark. Go tomorrow. It’s near the waterfall.” She gave them directions oriented by landmark as she stooped to pick up her lantern and rose stiffly from the bench. Kurenai nodded, memorized, and promised to return. They left Noriko at her sister’s house. Down the street the izakaya was closing, its owner wiping down tables and bringing in stools. Raidou and Ryouma must have already moved on. Kurenai and Genma followed, walking slowly through the dark street. They wouldn’t run where there were civilians to see. “I don’t want to think he murdered them, but it’s hard not to make that leap.” Genma kept an easy pace next to Kurenai, footfalls soft on the packed earth road through the village. “But if he could make the sake vanish so easily, he probably wouldn’t need a distraction to cover up vanishing their bodies.” The chorus of frogs and insects grew louder as they approached the woods beyond the village, underlain by the ubiquitous thunder of the falls. “Even the most high-level genjutsu still affect perceptions, not memories,” Kurenai said. “But an area-effect genjutsu could prevent the villagers from noticing anything unusual, or encourage them to avoid the warehouses until the theft was complete.” She started talking faster, spinning out a new theory that actually fit the facts. “Actually, the best method would be to cast a genjutsu that causes the brewers to perceive their warehouses as empty before the sake’s taken. That could give you up to two weeks to siphon the casks out. You wouldn’t need twelve wagons; you’d barely need one. And it would explain the sake-seller’s apprentice getting lost on the road from Hiraizumi, too. The thieves couldn’t let anyone approach until they’d finished their work.” She finished with a gleam in her eye. That was why she was on this mission: to be the smart one. Genma found himself getting excited now that they had a theory to work from. Kakashi inclined his head at the other two, stretched out at the base of one of the larger monuments. Raidou had his feet irreverently propped on the head of one of the smaller stone Jizo — but then if a bodhisattva couldn’t take the weight of a weary traveler’s feet, perhaps he wasn’t so enlightened after all. He and Ryouma both smelled like cigarettes and beer, an impressive accomplishment for a relatively short night’s work. Ryouma’s answer was the faintest of snores. Kurenai quickly outlined the information they’d gathered from Noriko and the theory she’d based on it. She reiterated her plan to poke holes in it in the morning after everyone had slept. Without a word, Ryouma rose to begin the trudge towards their campsite. Kakashi took rear guard, a somber shadow at their backs. He was always quiet, but he seemed particularly withdrawn as he dogged their heels. When they got to the campsite, he kept his silence while they activated scrolls and set up a pair of tents and a small hearth. Raidou took pity on Ryouma and helped with digging the latrine, while Kurenai folded down onto her bedroll and started the wearisome nightly routine of blister care. “What about Nomiya?” Ryouma asked in a low voice. He seemed as withdrawn as Kakashi, almost shut down. Genma was reminded of the hours after the Tsuto mission in Ibaragashi. He nudged Raidou’s foot with his own, and gave Ryouma a significant look. “If Nomiya’s responsible for the sake’s disappearance, or his family’s, we take him into custody,” Genma said. Ryouma looked up at him sharply, then back at the glowing coals. Kurenai rose to her feet, silent and purposeful. “I’d like to set wards, first.” She opened a belt pouch and extracted a roll of what looked like exploding tags, elegantly calligraphed. Kakashi’s gaze sharpened, he pushed the hair off his face, and for an instant both eyes reflected red in the firelight. While Kurenai peeled off a handful of the tags and charged them, Ryouma fished a trio of foil-wrapped packets out of the coals. He gave one to Kakashi, one to Genma, and set the third aside at Kurenai’s place. Without so much as a word, he crawled into his tent. Genma frowned. “Give me just a minute,” he told Raidou, and followed Ryouma in. Ryouma didn’t look happy at the intrusion. Mostly he looked leaden. “What’s wrong, Ryouma?” Genma said, pitching his voice low enough that it wouldn’t carry. For a man who made his living creating corpses, Ryouma had some startlingly deep holes in his foundation. What had set him off on the Tsuto mission? Killing the wife and daughter. There had been dead children on their first mission, too, but those little girls had been victims of demons, not other humans. This was far too big a problem to fix right here and now. There was more than enough evidence to conclude Nomiya had beaten and maybe murdered his family, or driven the wife to suicide. That was another nasty possibility that Genma hadn’t focused on yet, but he knew it happened. Trapped and desperate, she could have taken her children over the falls with her, with a prayer for a better life in their next incarnations. Harsh possibilities, but not any worse than the other horrors ANBU missions presented on a regular basis. Genma found himself seesawing again, on Ryouma’s fitness for the role he was in. If only he could read, maybe he’d make a good jounin-sensei. Or if medical training paid off, and Ryouma turned out to have a real aptitude, maybe he could become one of the regular medical corps. But no matter what he needed, they couldn’t solve Ryouma’s problems while they were on a mission. “How do things like that ever go?” Genma said. He sighed and crouched next to the fire to pick up his cooled food pouch. Seasoned rice with vegetables and chicken released a mouth-watering fragrance when he pried the edges of the foil apart. Kakashi’s eye sharpened, and he tapped his fingers to his tattoo in a crisp salute. “Lieutenant.” Taking two tin mugs of tea with him, he ducked into the tent after Ryouma. There was a moment of silence. The fire popped and crackled, sending a slender column of sparks dancing upward on the smoke. “Never thought I’d see you tell Hatake to be less emotional,” Raidou said quietly. “Since Raidou got himself suspended and all other problems faded in comparison?” Kurenai glided out of the darkness to rejoin them, without her roll of seals. Of course she’d been listening. She was Intel. Genma had lived with Aoba; he knew better than to assume any conversation wasn’t being eavesdropped on. “Since that, yes. And then the island mission and my mess with Kuroda.” Genma handed Kurenai her packet of takeout from the izakaya. He did? That was unexpected. Genma snorted, and Raidou’s lips quirked in amused resignation. She picked her dinner back up. “Do you have reason to believe he’ll jeopardize this one?” Kurenai asked. Raidou’s mouth curved into a crooked half smile. “Thanks, Kurenai.” He arched his back and stretched, popping the joints in his shoulders and neck, much less tense. And he knew Kurenai. If he trusted her, then Genma would, too. Genma ducked his head in an apologetic bow to Kurenai. “We know someone broke his knee young,” Raidou said, with a swift look at the tent. “I didn’t know about the disgraced chuunin,” Genma said. “That’s not in the file. That’s the grandfather? It certainly all fits, but…” He spun a chopstick between his fingers like a thick senbon. “I can’t even ask why Konoha would send a half-trained child away with a drunk. There were a lot of mistakes around the war, and a lot of orphans.” He stabbed his chopstick through the empty foil packet. “Does Intel know if Tousaki’s grandfather died?” Raidou asked. His eyes were on the fire, and his words measured. “I’m not worried about him killing Nomiya,” Raidou said. “I’m worried about him being distracted and getting himself killed by some goddamn demon or Mist ninja or falling tree.” All valid worries, and probably more likely than Ryouma going rogue, Genma had to admit. “Done.” Raidou twisted his back one way and then the other, one last limber up before settling down for the night. “Don’t stay up too late, Yuuhi,” he advised. Grabbing a cup and his toothbrush, he headed for the river’s edge to wash up before bed. Genma wasn’t sure what to make of the sudden curl of warmth in his chest. “I won’t. I— thank you, Yuuhi.” Feeling numb-tongued and a little out of his depth, Genma went to wash his face in the icy water next to Raidou. When he got back to the fire, Kurenai’s seat was empty, and her shoes were outside her tent.